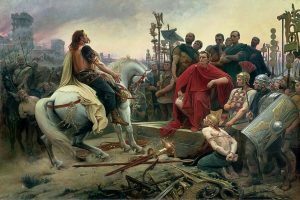 Caesar’s conquest of Gaul was a prelude to the start of the Second Roman Civil War, marking the beginning of the end of the Roman Republic. 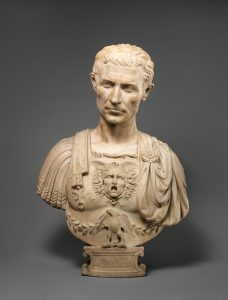 In 58 BCE, Roman proconsul Julius Caesar, a member of the first Triumvirate and an important political figure in the Roman Government, was forced to flee the very city he helped rule. As debts from his political aspirations and a general souring of relations among members of the senate began to catch up with him, an opportunity presented itself.1 To the north of Italy, the massive frontier of modern day France and Belgium provided a persistent thorn in the republic’s side. For years, the tribes of Gaul had descended on Italy, raiding and pillaging. As a land ripe with spoils and slaves, acting hostile to Rome, no better opportunity could be offered to Caesar. If he stayed in Rome, his debts would be called in. Unable to pay them, he’d be cast out of Rome, and his family name would be sullied. But in Gaul, glory in combat and vast new territory awaited him, should he survive. Victorious from the siege, Caesar next marched his resupplied and fed legion to the city of Gregoria. However, Vercingetorix was lying in wait. Using the days Caesar spent sieging Avaricum, he was able to burn every bridge in the area as well as raise a cavalry to use against the legions. The Romans were not prepared for this level of organized resistance. The Gauls held the high ground surrounding the city and could easily survive a siege if Caesar ordered it. Rather than retreat and muster more troops with more supplies, Caesar ordered his forces to push forward, thinking the brute force of his legions would frighten the Gauls into a retreat. This miscalculation and resulting blood bath left Caesar’s legions in disarray. In his commentaries on the battle, Caesar states that he lost at least forty-six centurions and some seven hundred legionaries, though these numbers are likely much higher.9 Caesar regrouped the surviving legionaries and retreated into friendly territory. Although the victory was a huge moral boost to the Gauls, it would not be enough to stop Caesar. Gaius Julius Caesar, The Conquest of Gaul (Penguin Classics, 1983), Book 7, Chapter 10. Gaius Julius Caesar, The Conquest of Gaul (Penguin Classics, 1983), Book 7, Chapters 16-28. Gaius Julius Caesar, The Conquest of Gaul (Penguin Classics, 1983), Book 7, Chapter 51. Gaius Julius Caesar, The Conquest of Gaul (Penguin Classics, 1983), Book 7, Chapter 56. The Greenhaven Encyclopedia of Ancient Rome, 2002, s.v. 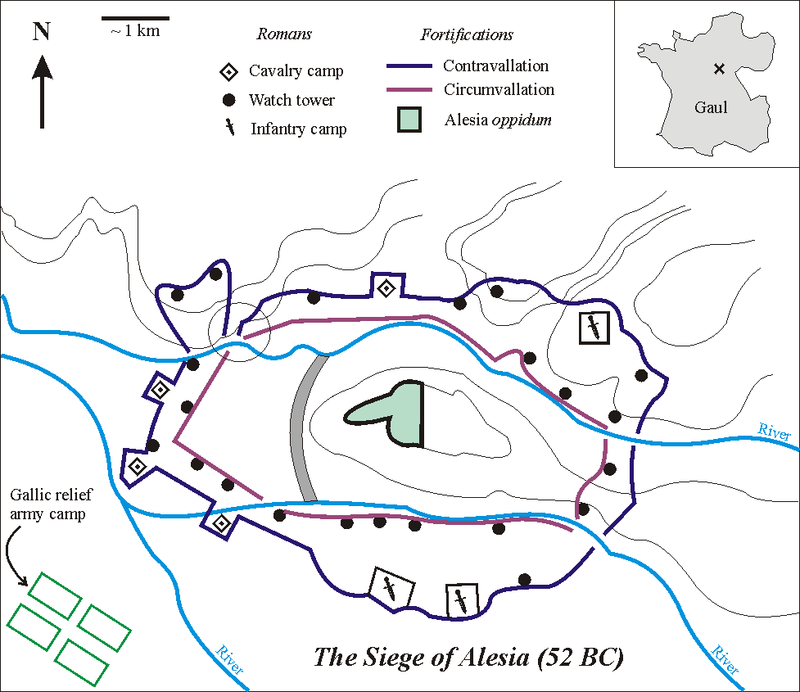 “Siege of Alesia,” by Don Nardo; The Greenhaven Encyclopedia of Ancient Rome, 2002, s.v. “Battlefield Tactics,” by Don Nardo. The Greenhaven Encyclopedia of Ancient Rome, 2002, s.v. “Battlefield Tactics,” by Don Nardo. The Greenhaven Encyclopedia of Ancient Rome, 2002, s.v. 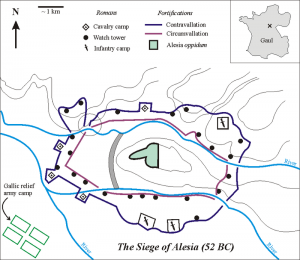 “Siege of Alesia,” by Don Nardo. Encyclopedia of World Biography, 2004, s.v. 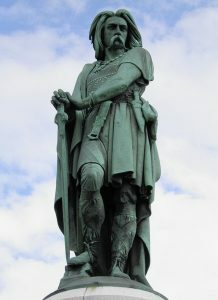 “Vercingetorix;” The Greenhaven Encyclopedia of Ancient Rome, 2002, s.v. “Siege of Alesia,” by Don Nardo. Originally published by StMU History Media, St. Mary’s University, republished for educational, non-commercial purposes. This entry was posted in Ancient, Gauls, History, Julius Caesar, Roman, Rome. Bookmark the permalink.